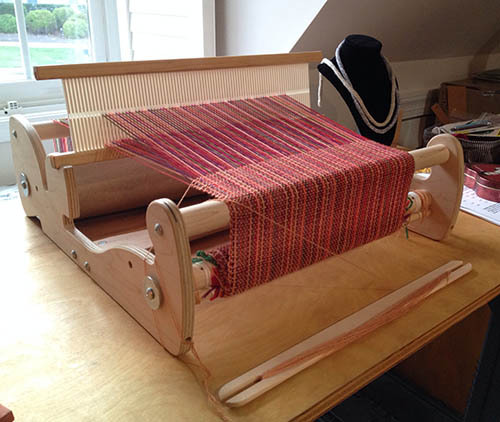 We are excited to share with you a guest post, written by one of our weaving students. For those of you who do not know about our weaving classes, we offer regular classes on beginning weaving, which includes loom rental for 2 weeks to complete your woven scarf. See our class calendar for upcoming classes. Sometime last year I got the notion that I’d like to learn to weave. Really, I was less interested in what I could make by weaving and more in learning what it feels like to create the woven cloth. A big part of fashion design is understanding different fabrics, and what distinguishes a sateen from muslin from velvet is the different methods of weaving each kind of fabric. Even relatively similar looking fabrics, like cotton shirting, have subtle but important differences in the weave. I read and read about the differences, but they were hard to grasp mentally. So I decided to grasp them, manually, by doing some actual weaving. Not long after I moved to North Carolina my mom and I made a trip to a local yarn store, Warm ‘n Fuzzy. They have an incredible selection of yarns, mostly from small companies, and offer many classes. 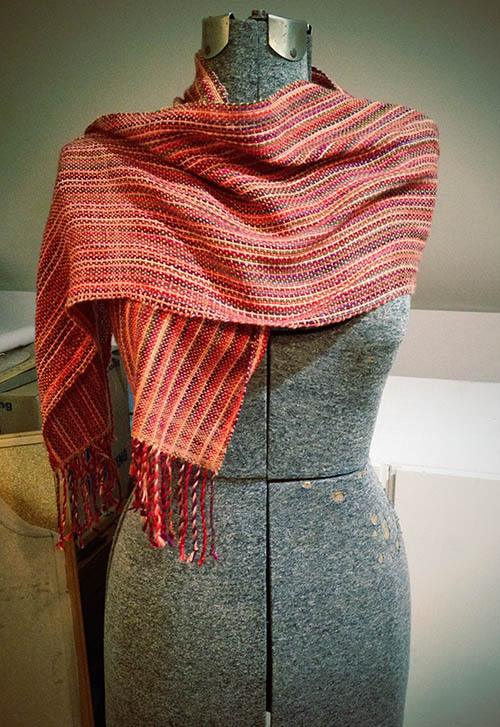 I saw Beginning Weaving on their upcoming class list; at $85 for about 8 hours of class time, it seemed like an affordable way to learn about weaving without committing too much time or money. The weaving itself was pleasurable in a way similar to knitting: a meditative process that required paying close attention to the performance of the same action over and over again, made pleasant by the sensual qualities of the working material. The different colors and textures came together in a process as slow and delightful as the progression of a sunset; the gradual assembly of a grid from round looping yarn balls gave endless satisfaction to my systematic brain. I have to admit, I wasn’t the most fastidious beginning weaver. But then, I’m not the most fastidious anything. When trying something for the first time I like to jump in, get a feel for it the process, and screw up a bit. I can appreciate how things work by seeing them not work. So my selvages (the self-finished edges where the weft wraps around) are a bit sloppy, and the weave is hopelessly uneven. Even so, the result is beautiful: the yarn colors are like a fall-toned rainbow, and the cloth is surprisingly light and drapey. I don’t usually add fringe to scarves when I knit them, but for this scarf I did a twisted fringe, and I love it. 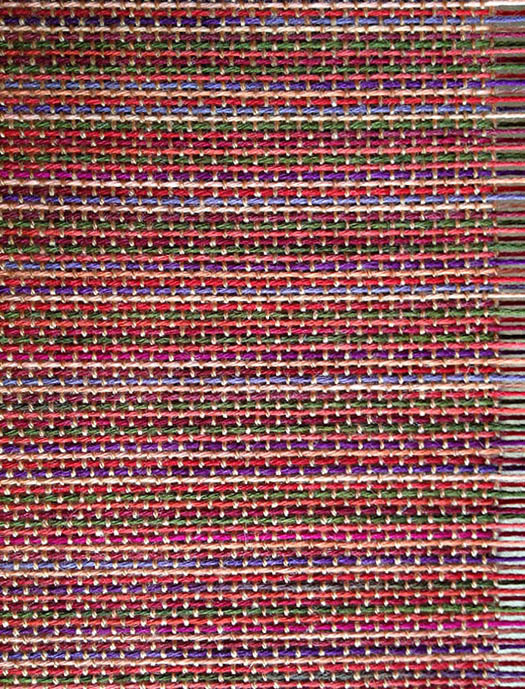 The experience of weaving had its intended educational outcome: I now have a feel for what it means to weave cloth, even if I’ve only scratched the surface of different weaving patterns and techniques that are possible. I’m pretty swamped with sewing responsibilities right now, so I’m going to hold onto my new weaving skills, if you could call them that, for a later date when I can practice and experiment with materials. I really like the idea of weaving with scrap yarn, fabric strips, or non-traditional materials like used bicycle tubes.